Rabbi Gerald Meister declares that Islamofascists are at war against Christians, Jews, and the God of Jacob, the sustainer of the Covenant. Rabbi Meister delivered these remarks at the Christian Zionist Proclaiming Justice to the Nations' International Christian Prayer and Action Event at the National Religious Broadcaster's Conference in Nashville, 2/19/12. Prof. Abraham Sion of Ariel University's Center for Law and Mass Media discusses the struggle to maintain security of the Jewish state in the face of the Islamist imperialist crusade-, which exploits a false Palestinian nationalist narrative to disparage Israel diplomatically and destabilize Israelis' own nationalism. Prof. Sion invokes the cautions of Zionist pioneer, Ze'ev Jabotinsky, out of concern that the diaspora is, like pre-Holocaust Europe, turning against its Jews- who should unite in self-defense in Israel. Laurie Cardoza Moore and Stan Moore, of Proclaiming Justice to the Nations, held a panel on Christian Zionism, philo-Semitism, and opposing Islamist imperialism concomitant with the National Religious Broadcasters event in February of 2011. Speaking are former CIA Director James Woolsey, radio host Janet Parshall (awarded the 2011 Ed McAteer Tree of Life Award), and British-raised Rabbi Gerald Meister. 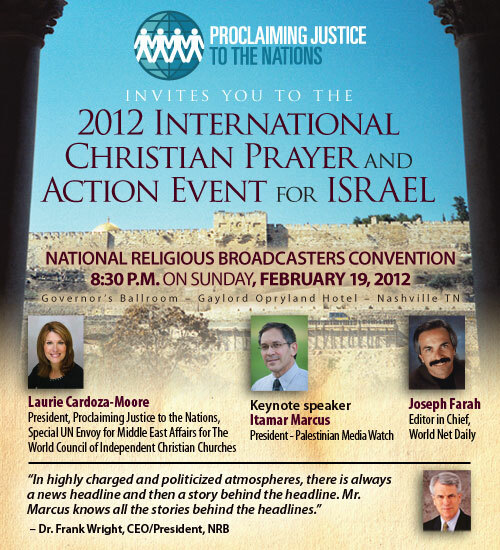 In 2012, PJTN will hold a International Christian Prayer and Action Event for Israel on Sunday 19 February with Palestinian Media Watch's Itamar Marcus and World Net Daily Editor in Chief Joseph Farah.